Dan DeWeese: One of the epigraphs in Up Up, Down Down is a quote from Coleridge: “O me! that being what I have been / I should be what I am.” One of the things a number of the essays touch on, in various ways, is that the person you are as an adult seems in some ways far, geographically and culturally, from where you started as a child. Many adults, of course, end up far from where they started, but most don’t reflect on it in essays. I’m wondering what you feel the act of writing—and maybe specifically the form of the essay—has offered you as you navigate adult disorientation that casual conversation or silent contemplation of the sunset does not. Cheston Knapp: I’m happy to hear that that question of identity came through, and with the attendant disorientation I experienced in confronting my own, such as it is. It’s funny, the counter examples you give here, because once upon a time I think I might’ve said I wanted the book to feel like a casual conversation that nudges the reader into something like silent contemplation. And that ambition has everything to do with the essay form, which thrives on confusion and frustration. At its best, in my opinion, it treats uncertainty and ambiguity as positive qualities, as values to be nurtured, not shunned. I came to the form relatively late in the game, having started out wanting to write mostly fiction. But I’d grown dissatisfied with what, at the time, I perceived to be a pretty limited (and monstrously limiting) understanding of “story.” This has almost everything to do with my work as an editor, I believe, and with certain icky-gross and knotty questions about what the market chooses to validate. Or not. Mostly not. But the simplest answer is that in writing these things I felt free, like I could more readily capture the way my mind was moving through experiences, current and past. Looking back on the book now, I think I can see myself embracing this freedom—the three pieces written for it alone are longer and more playful and sprawlingly digressive and welcoming of resonance and complication than the earlier ones. The danger you court in writing this way, though, is that the essay can end up feeling like it’s only for you, that you’ve crowded the reader out with the particularities of your experience. You’ve got to calibrate these things so that whatever of “you” is in the piece is in strict service to a broader/deeper inquiry. DeWeese: It’s interesting that you mention wanting to be able to capture the way your mind was moving through experiences, because the essays are about topics that are quite bodily, too, by which I guess I just mean these are not abstract ruminations. You’re writing about wrestling, tennis, skateboarding...bodies are attempting or being subjected to a number of experiences in these essays. Are the concrete situations the broader inquiries you’re talking about in that previous answer? Or is the broader/deeper inquiry something that is neither what the body experienced nor the way the mind moved? Knapp: You’re right—there’s totally a kinetic element to many of these things. It plays a slightly different role in each, I think, so that, e.g., the pro wrestlers I followed serve as something of a foil for me, and allowed me the opportunity to think about things like pain and experience and the complicated distinction between fake/real, and then there’s the skateboarding piece, which uses my time at the adult skate camp as a narrative backbone, allowing me to peel off and discuss nostalgia. By broader/deeper inquiry I mean anything that extends beyond just the experience/experiencer at hand. A successful personal essay, to my mind, inhabits this middle ground between the genres of memoir and what I’ll broadly call The Thinky Dinky. I didn’t fit peaceably in either genre, wanted rather to do some combo of the two. To tell stories and do some thinking, while not necessarily hewing to a strict argument or scaring a lay reader off with too much jargon or specialization, with stale and sterile “learning.” I’m much more interested in tilting at something huge and irresolvable (“experience,” “pain,” “authenticity,” “community,” “nostalgia,” etc.) and building an essay that encourages a reader to think for him or her self, to follow his or her nose into the meat of the animating/inciting questions. DeWeese: When you say “building” an essay—if your goal is to encourage a reader to think for him or herself, what kind of material do you avoid or just forbid yourself to build with? What kind of stuff could easily be placed into essays like these, but would alter their structure in ways that you feel would shut down either the narrative aspects or the invitation to thinking? DeWeese: The bulk of your writing career, so far, has been as an editor. How has the process of writing and publishing these pieces individually, and then collecting them in a book that gets reviewed and appears in bookstores, impacted the way you think about your work as an editor, or about the writing/editing/publishing process in general? Knapp: Oh man, the process. My “career.” I don’t think this experience has impacted my editing—I will continue to strive to make the process as unshitty as is humanly possible. It’s a rare delight to work with a writer I respect, whose sensibility expands and sharpens my own, and I know how fortunate I am to find myself doing it. But publishing? Not worth valuing in itself, I don’t think. The controlling metaphor we’ve adopted to talk about publishing a book is that of birth. You hear this mindlessness all the time—“Publishing a book is like giving birth.” I found this to be singularly and spectacularly false. In my experience it’s been much more like a prolonged period of mourning. Now I’m more bemused than anything else that it’s out there in the world for folks to encounter or ignore. It’s all a problem of competing economies, which Lewis Hyde so artfully demonstrates in The Gift. DeWeese: Why a prolonged period of mourning? Knapp: Just the facts: in order to become something for someone else, the thing, in a way, has to die for you. What follows the writing, the long lovely living-with whatever’s been written, is all business and marketing. Publicity. It is one big needling mindfuck of an experience, real pernicious gaslighting to be sure, to know you’ve won and yet to be made to feel like you’re losing. DeWeese: I’m pleased to note that’s almost a Gordon Lightfoot lyric. Books of essays by a single author definitely offer a different reading experience from opening a literary magazine, in which there are a variety of pieces from different writers. What kind of rethinking (or rewriting) did you have to do when you began to think about these pieces all appearing next to each other between two covers? Knapp: I loved that work, yoking these pieces together. By the time I was working on the last three (“Far From Me,” “Neighborhood Watch,” and “Something’s Gotta Stick”) I knew they were going to be part of a book. So as I was writing I was thinking about how they were leaning against the others, how they might amplify or augment a piece of information I’d given before or knew would come after. But after I finished those, I ended up having to do massive rewrites of parts of the essays that’d come before. So I revised a bunch of “Faces of Pain,” the first essay, with the thought that it would set up several different themes that recurred in the later essays (authenticity, experience, pain, etc). And had to rewrite more than half of the UFO essay, “Mysteries We Live With,” to make it fit. But the obvious metaphor here is that of being at a mixing board, where you’re looking at everything you’ve set down and are thinking very granularly about how you’re trying to make meaning, when you want the music to swell and when you want it muted. That was, hands down, the best part of working on the book. DeWeese: Writers are (too-?) often asked about their influences, but that’s not necessary here, because “Far From Me” directly addresses influences of yours—mostly in the persons of Roger Federer and David Foster Wallace. I like that in the essay, though, you recognize that when you teach students, you are also now an influencer—on the other side of the relationship. You cover a lot of interesting ground about the notion of authenticity in that essay, both in tennis and in writing. Now that you’re also a parent, though, as well as a writer sitting on panels or reading up at the front of the room, I’m wondering what kind of authenticity issues you’ve encountered in the role of influencer. I ask this because I am also a parent/teacher/writer, and often sense people prefer those roles to be enacted a certain way—not necessarily “my” way. Knapp: It’s hard to say, really. Getting in front of folks and performing the role of “writer” or “editor” or “teacher” brings on a different set of jimjams. The story we as a society tell is that it’s good to be an influencer and bad to be influenced. Not only bad but shameful. Which was why I wanted to write about it, to examine that shame, to prod that fault line of my character. Being influenced is a private do-si-do, an affair no one sees, and that lent the process a kind of mystery, one I wanted to lay bare, to the extent that’s possible. To influence others, on the other hand, is public, which means that you’re immediately subjected to the needs/demands/desires of other people. There’s always a thou waiting there for my I. In my case, thankfully, the number of those thous is very, very low. But still, in the rare moments I’m called upon to perform such a role, I think I’m probably most nervous that I’ll come off as just another undercooked turd-burger. The world’s full of thoughtlessness sold as depth, uppish hot-takes as insight, impotence as power, fame as achievement—glittery tempting as it is, I want nothing to do with that kind of hollowness. I’d like to believe I strive for the good old spiritual values of honesty and humility. In a public role, this entails listening, sympathy, and compromise. The only time I expect things to be entirely “my” way, in other words, is while working, writing. DeWeese: One last question, and I’m not sure I’m going to be able to ask this well, so I’ll just flail a bit. 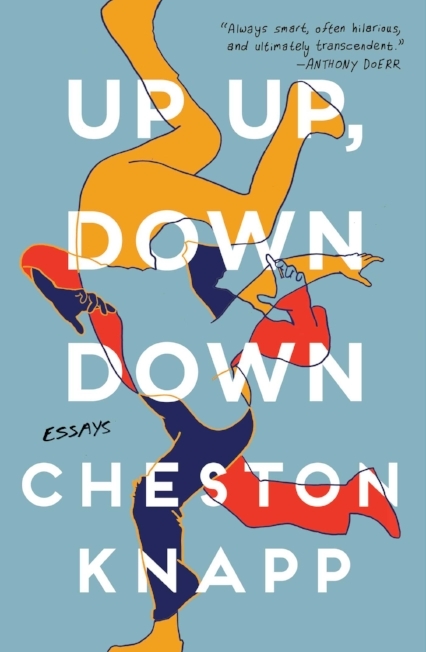 The essays in Up Up, Down Down, because they are grounded in concrete experiences—places you’ve been, people you’ve known—acquire a kind of historicity as time passes. In other words, you were with those wrestlers in year X, and at that skateboarding camp in year Y, but is it now year Z. I wish there was a literary term for this—and maybe there is and I’m just not thinking of it—but my sense is that there are memoir aspects of the essays that only emerge over time, almost like a Polaroid photo whose image emerges only very slowly. Now that these pieces are collected in a book, do you see anything in them you didn’t see at the time you were first working on them? Do you see the man who wrote them any differently? Knapp: Wow—that’s precisely how I’d hoped the memoir aspects would feel, that sense of emergence, especially over and against the way we tend to conceive of identity as static... I don’t think I see anything else in them now—in fact, case might be that I see less in them. They seem to be slowly eroding in my mind, the words unfastening from the page, letters tumbling to the ground with clinky thuds and tinny clunks. A thing’s most alive for me when I’m working on it, thanks largely to the fact that the work makes me feel alive. But I admire the man who wrote these essays for his optimism and ambition, naive as I now believe both to have been. I’d love another hit of that heady brew. Cheston Knapp is the managing editor of Tin House. With his wife and son, he lives a life of reluctant modesty in Portland, Oregon. Dan DeWeese is the author of the novels Gielgud and You Don’t Love This Man, and the story collection Disorder.